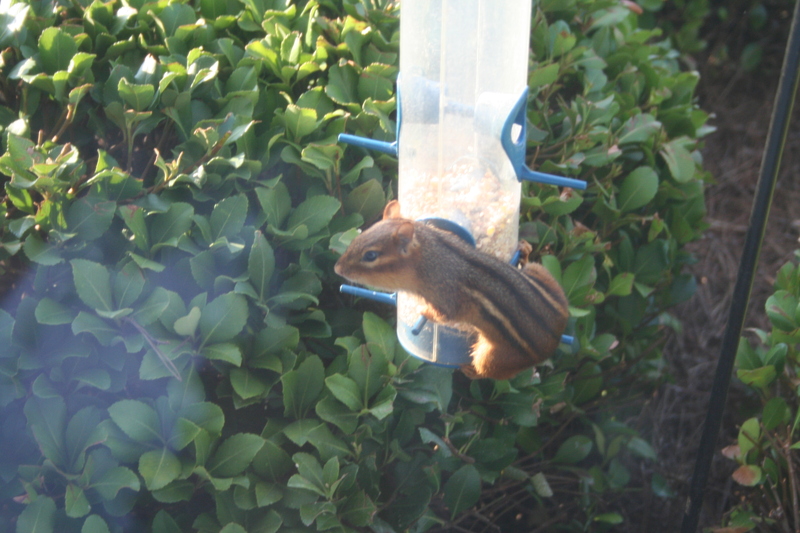 We saw the same (well, I’m assuming here, but most chipmunks look alike) chipmunk this morning and Elizabeth got to watch him for quite a while.Â I asked her what his name was and she said “booberries”.Â So meet our new chipmunk, Booberries. We threw Elizabeth’s leftover breakfast (cereal, blueberries, and strawberries) out the front door at the bird feeder, thinking that Booberries might enjoy some actual blueberries.Â As far as I can tell, having fruit hurled in his direction made him a bit shy and he hasn’t come out again since. At least not that we’ve seen. Elizabeth is so proud of her new “puur-pul diapee!” that she almost didn’t let me put pants on her this morning. We went to story time at the library (wearing pants) again this week.Â Each time we’ve gone before (four times, I think, it’s once a week), there have been four kids and that included us.Â Today there were fifteen.Â I don’t know what is up with that. The library calls this program story time.Â It’s an hour long.Â They read one story.Â I’m not complaining at all, Elizabeth loves it, socializing is good and all.Â But it should really be titled play group or even circle time at the library.Â I just don’t like things to be misclassified.